On 1/28/19 – 2/1/19; C-VINE News citizen journalists will be at Fort George G. Meade Military Base in Maryland to observe the military commission pre-trial proceedings through LIVE Stream cctv scheduled for United States v. Khalid Shaikh Mohammad et al in GTMO. Khalid Sheik Mohammed, called KSM, is accused of engineering the Sept. 11 attacks by proposing the plot to Osama bin Laden in 1996, overseeing the operation and training the hijackers in Afghanistan and Pakistan. The International Committee of the Red Cross says Pakistani authorities arrested him March 1, 2003 in Rawalpindi, Pakistan. The CIA waterboarded him before his 2006 transfer to Guantánamo Bay. In March 2007, according to a military transcript, he boasted: ‘‘I was responsible for the 9/11 operation — from A to Z.” In court, he typically wears a hunting pattern camouflaged jacket or vest, an attire he adopted after his lawyers litigated and won the right for him to do so in 2012. He has argued through his lawyers that that he considers himself a legitimate combatant entitled to Geneva Convention status as a prisoner of war. At Guantánamo, Mohammed has described himself as a revolutionary-like George Washington. Walid bin Attash, allegedly ran an al Qaida training camp in Logar, Afghanistan, where two of the 19 Sept. 11 hijackers were trained. Osama bin Laden allegedly selected him as a Sept. 11 hijacker but he was prevented from participating when he was arrested and briefly detained in Yemen in early 2001. The Pentagon also says he traveled to Malaysia in 1999 to study U.S. airline security. The ICRC says Pakistani authorities arrested him on April 29, 2003 in Karachi, Pakistan. In court, he has banished his Pentagon paid defense attorneys from sitting at his defense table in a repeated effort to try to fire them. His trial judges have found that he has no good cause to do so, so his lawyers sit at the rear of the court when he attends hearings. Prosecutors at times call him “Khallad,” a name he used before his capture. Ramzi bin al Shibh, a Yemeni, allegedly helped the German cell of hijackers find flight schools and enter the United States, and helped finance the operation. He allegedly was selected to be one of the hijackers and made a ‘‘martyr video,” but was four times denied a visa at U.S. embassies, in both Berlin and his native Sana’a, Yemen. The ICRC says Pakistani authorities arrested him Sept. 11, 2002 in Karachi, Pakistan, the first of the five alleged conspirators in the 9/11 attacks. Bin al Shibh has argued for years, mostly through his lawyers but at times through disruptions, that somebody at the clandestine Camp 7 prison where he and the others are held is disrupting his sleep through noises and vibrations. Prosecutors deny the event is happening. In 2016 he testifiedabout the issue and the first trial judge ordered the prison to stop doing it, if they are indeed doing it. Ammar al Baluchi, charged as Ali Abd al Aziz Ali, is alleged to have sent approximately $120,000 to the hijackers for their expenses and flight training, and helped nine of them travel to the United States. He was born and raised in Kuwait, and is Khalid Sheik Mohammed’s nephew because his mother is KSM’s brother. The ICRC says Pakistani authorities arrested him on April 29, 2003 in Karachi, Pakistan. His U.S.-educated wife, Aafia Sidiqqui, was captured in Afghanistan but unlike her husband was taken to New York City for trial. She is now serving an 86-year sentence. His lawyers have been the most aggressive and by some measures most creative in filing legal challenges to the proceedings. In one failed effort to get discovery about what happened to their client in CIA custody they argued that the makers of the Hollywood film ‘Zero Dark Thirty’ got more details than they did. Mustafa Ahmad al Hawsawi, a Saudi, is alleged to have helped some of the hijackers with money, Western clothing, traveler’s checks and credit cards from an office in Dubai. The ICRC says Pakistani authorities arrested him March 1, 2003 in Rawalpindi, Pakistan. Hawsawi served as a witness via a sworn statement conveyed by the CIA in the Zacarias Moussaoui trial, saying he had seen Moussaoui at an al Qaida guesthouse in Kandahar, Afghanistan, in the first half of 2001, but was never introduced to him nor conducted operations with him. This slight captive who suffered rectal damage in agency custody, according to the so-called Senate Torture Report, generally only comes to court on the days the judge mandates it. His lawyers for years have sought to have his case peeled off from the other four, severed as they say in court, to obtain swifter resolution. Prosecutors have opposed a separate trial for Hawsawi and the judge has so far rebuffed those efforts. Seven crimes are alleged in the 9/11 sworn charge sheet starting with conspiracy, specifically with Osama bin Laden, other senior al Qaida members and the 9/11 hijackers. They are also charged with committing murder in in violation of the law of war, attacking civilians, and terrorism. Mohammed, bin Attash, Bin al Shibh and Baluchi are also charged specifically with hijacking four aircraft — two that hit the World Trade Center towers in New York, the one that hit the Pentagon and the one that crashed in the western Pennsylvania countryside. According to the Pentagon, the attacks killed 2,976 people. Conviction can carry the death penalty by a method to be chosen by the Secretary of Defense. The Pentagon has built a $12 million Expeditionary Legal Complex atop a long-ago abandoned runway on the U.S. Navy base’s Windward side. At the center is a snoop-proof courtroom capable of trying six alleged co-conspirators before one judge and jury. Media and other observers are sequestered at the rear in a mostly soundproofed room behind three-layers of Plexiglas, and hear the court audio feed on a 40-second delay. The judge at the front and a court security officer have mute buttons to silence the feed to the observers’ booth, if they suspect someone in court could spill classified information. Pentagon workers have installed a blue curtain inside the spectators gallery to separate victims, chosen by lottery, from the other observers at the back of the courtroom. See a 2011 Pentagon video tour of the courtroom. Construction of the compound began in the summer of 2007 after a C-130 Hercules cargo plane landed on the McCalla field, the current site of Camp Justice, and delivered three trailers specially equipped for legal staff to handle Top Secret material. Called “Razors,” they look like shipping containers. More materials came by barge, and ground was broken for the court itself on Sept. 11, 2007. In early 2018 the Pentagon disclosed that the trial judiciary had about 730 hours of audio recordings of war court hearings, and that the U.S. military considered even audio of open-court proceedings to be classified. An up to $19 million expansion is underway. The contractor also helped rebuild the World Trade Center after 9/11. Army Brig. Gen. Mark Martins, left, the chief war crimes prosecutor since July 2011, has named himself and eight other prosecutors to the case. The lead 9/11 case prosecutors, or trial counsel, are retired Army Col. Robert Swann, formerly the Pentagon’s chief prosecutor for military commissions, and Edward Ryan, a civilian attorney with the Department of Justice. Both men had the case during the Bush era. Deputy trial counsel include Clayton G. Trivett Jr., a reserve Navy lieutenant commander and Jeffrey Groharing, a reserve U.S. Marine lieutenant colonel. Nicole Tate, a civilian, is an assistant trial counsel, as are Air Force Maj. Christopher Dykstra, Army Capt. Neville Dastoor and Marine Maj. Benjamin Mills. The general for years was the most public voice, and face, of the war court. Then in November 2017, he stopped giving news briefings and holding press conferences. Also assigned are Marine Lieutenant Colonel Derek Poteet and civilian attorneys Gary Sowards, Denny Leboeuf and Rita Radostitz for Mohammed; Army Major Matthew Seeger, Air Force Captain Brian Brady and civilian Edwin Perry and William Montross for Bin Attash; Alaina Wichner, Navy Lieutenant Mishael Danielson for Bin al Shibh; Air Force Lieutenant Colonel Sterling Thomas, Air Force Captain Mark Andreu and civilians Ben Farley and Alka Pradhan for Baluchi; Army Lieutenant Colonel Jennifer Williams, Army Major Joseph Wilkinson, Navy Lieutenant Commander David Furry and civilians Sean Gleason and Suzanne Lachelier for Hawsawi. The Pentagon prosecutors list 2,976 victims in their conspiracy charge sheet and the Defense Department has created three ways to show their families what’s going on at their Guantánamo. trials A retired Navy captain, Karen Loftus, runs a prosecution division that gives them news updates, provided they meet the Defense Department definition of a victim — spouse, parent, sibling or child of someone killed in the attack. That status lets them sign up through a special victims portal in the war court’s website, and also gets victims access to four viewing centers at military bases on the Eastern Seaboard — in New York City, New Jersey, Massachusetts and outside Washington D.C. Registered victims are also eligible for a lottery that chooses five people to travel to each Guantánamo war court hearing as guests of the Pentagon with distinguished visitors privileges. Each can bring a fellow traveler along, gratis too. The accused plotters were charged on June 6, 2008 but President Barack Obama halted that trial to consider whether to hold it in federal court in New York City, and to ultimately reform the military commissions in collaboration with Congress in 2009. The reformed war court gave the accused Pentagon paid capital defense counsel and forbade the use of coerced testimony or statements derived from torture in confessions by the accused. The court has its own website, built by the Department of Defense beginning in 2010 with a $487,369 development contract. Its motto is “Fairness * Transparency * Justice.” Intelligence agencies control the release of the pleadings, decisions and orders. Lawyers, and even the judge, file their documents with a special military commissions clerk who withholds them from the public while they circulate throughout the U.S. Intelligence Community to black out classified or sensitive portions (or all) of the documents before they are posted at the website. Pentagon regulations say the scrubs are to be complete within business days of the filing but often the process takes much longer than that. Other pockets of the website link to video of Pentagon press conferences related to the war crimes trials and a guide to the office spaces arrayed around the tent and trailer park compound. By Linda Forsythe – Volunteer Citizen Journalist, News Commentator & Founder of the C-VINE International Foundation. This rapidly growing, grass-roots effort is exciting to watch as Patriots join together to MAGA. All this and future Military Tribunal information will be released to the public after Department of Defense final approval & posted on the C-VINE.com website. This article was posted by our C-VINE team of volunteer workers, investigative reporters, and citizen journalists, who make certain all information is vetted for accuracy before publishing. 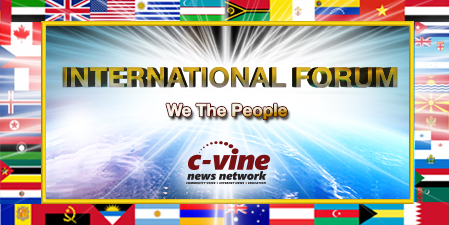 C-VINE News is placed in a Foundation, also called a Charitable Trust and is run by, “We the People”.